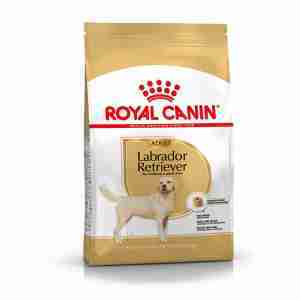 Royal Canin Labrador Retriever Adult is a specially formulated complete food designed to help your labrador maintain his or her ideal weight. This food has been designed specifically for adult labradors over fifteen months old and contains a carefully calculated level of calories to keep your pet at their optimum weight. The uniquely shaped kibble has been designed to appeal to the labrador breed and to encourage your dog to eat slowly without bolting their food. Fatty acids EPA and DHA, found in fish oil, are essential for supporting your dog's bones, skin and coat. Your labrador's skin is designed to act as a natural protective barrier and the combination of nutrients in this food will support it in doing this. exclusive complex of nutrients supports skin's role as a natural barrier. Labradors as a breed are particularly prone to putting on weight, meaning that it can be especially difficult to help them maintain their ideal size and shape. Since weight gain can be gradual, you might not immediately notice that your dog has become overweight. Other signs that your dog might be overweight include a lack of energy, moving more slowly or panting a lot after only light exercise. As your pet begins to lose weight, it's likely that they will regain their interest in play or exercise – both things that will help them return to their optimum weight. If your dog's weight gain persists, or if you notice any other unusual symptoms, it's a good idea to take them to the vet for a check up and further advice.